Seeing with the Heart in The Little Prince – The Bookshelf of Emily J. The Little Prince (1943), number 92 on the BBC book list, is a short, sweet allegorical novel about the important “things” in life. 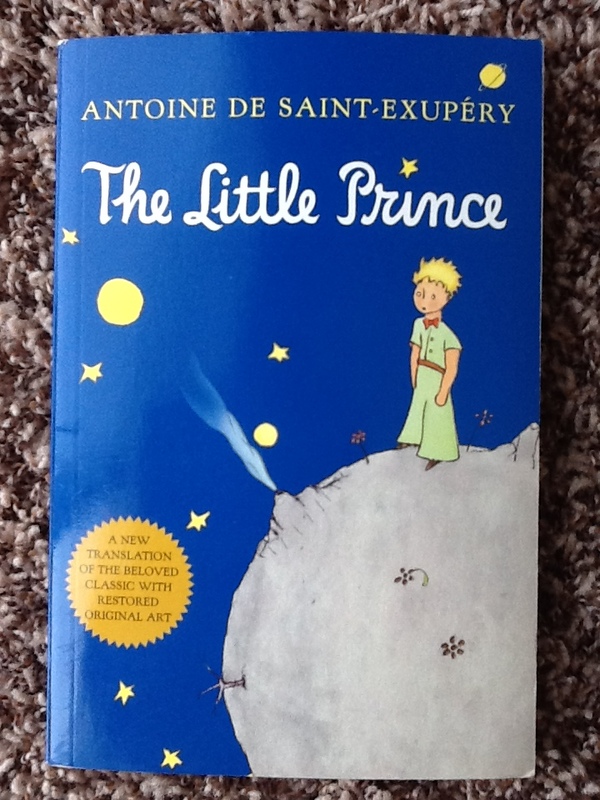 Antoine de Saint-Exupéry explores these ideas through the unexpected friendship of his protagonist (seemingly an autobiographical depiction) who has crash-landed in the Sahara desert, and the little prince, a child visitor from another planet. The prince and the stranded pilot exchange ideas and thoughts on their planets, and the result is a rich treasury of life’s most important truths and how to attain happiness. My favorite themes of the book are the ideas that grownups just don’t understand and that they forget so quickly the innocence of youth. This idea is immediately introduced through the crashed pilot’s discouragement from being an artist at the age of six. How many of us were discouraged from our dreams at such a young age because of cynical grownups, busy lives, or parental expectations that were unreal? Could we have turned out differently (or more happily) if that dream hadn’t been crushed? Could we avoid midlife crises by not teaching children what they can’t do? And yet The Little Prince reveals that children sometimes know better. They just keep quiet. De Saint-Exupéry wrote, “Grown-ups never understand anything by themselves, and it is exhausting for children to have to provide explanations over and over again” (p. 2). He explained that many adults have forgotten what it’s like to be a child. I remember acutely what it’s like to be a child, but since becoming a parent, sometimes I’m too exhausted to care or too overwhelmed to be in touch with that side of myself. I could do better. I also liked the section that reveals how silly adults sometimes are when it comes to numbers. He explained that grownups like numbers and never ask the important questions. When they meet someone new, they want to know how old they are, how big their house is, or how much money they make. The essential questions are more along the lines of what this person likes to do and what makes this person “leap out of bed in the morning” (to quote Meryl Streep as Julia Child and my own blog post). I appreciated the ideas about kings and authority. Kings believe that all men are subjects. That is true, but I found it applicable to relationships. Those most trying are with people who tend to view themselves as kings. And yet, we learn a few pages later that authority is based on reason. One cannot rule well or justly without being reasonable. The idea of planets at first struck me as ridiculous, but then I remembered to think as a child would and to enjoy the story. And then I realized that the planets had a deeper meaning, of course, because this is an allegory. We are all on our own planets. We can all be lonely or separated or shortsighted because of this. When telling about the lamplighter, the little prince said, “That man is the only one I might have made my friend, But his planet is really too small. There’s not room for two…” (p. 43). How many times have we shut out possible friends because our planets are too small? I guess we all go through phases, and sometimes one must protect one’s planet, but planets should be big enough to share. The phrase, “Trying to be witty leads to lying, more or less” hit home for me (p. 48). I tend to exaggerate when I tell stories in groups, and my husband calls me on this. If something interesting happened once, in telling the story I will claim that it happened “at least five times.” If a number (there are those pesky numbers again) can be exaggerated, then I will elaborate and embellish. It’s fun to tell stories and to be dramatic. I guess, according to The Little Prince, I’m just lying! Overall, the little book reminds us that “One sees clearly only with the heart. Anything essential is invisible to the eyes” (p. 63). This is one of those truths we all know, but we forget. We have all had experiences that remind us of the importance of people over things, but we lose sight of that and get caught back up into our busy and commercialized lives. Perhaps reading and rereading good books, such as The Little Prince (and for me, my scriptures), can help to remind us of what’s most pressing, most valuable, and most worth our time and attention. Here are some of the other great quotes and thoughts from The Little Prince. “Vain men never hear anything but praise” (p. 34). “It’s also lonely with people” (p. 51). “But since there are no stores where you can buy friends, people no longer have friends” (p. 60). “But my rose, all on her own, is more important than all of you together, since she’s the one I’ve watered. . . . Since she’s the one I listened to when she complained, or when she boasted, or even sometimes when she said nothing at all. Since she’s my rose” (p. 63). “But eyes are blind. You have to look with the heart” (p. 71). I Laughed, I Cried, I Rejoiced! Thanks! It really is a gem. That is so true! I took many Spanish classes in college and got to the point where I was dreaming in Spanish and understanding most of what I read and heard. I couldn’t speak it well at all, however. I think that sort of fluency comes faster with having lived in a Spanish-speaking country or going through an immersion program. I’ve lost it, too! So sad. I especially liker this line: “But since there are no stores where you can buy friends, people no longer have friends” (p. 60). Yes, me too! It really says all we need to know about capitalism and our greed for more more more. this is one of my favourite books! What people say in Argentina is that you must keep this book at hand, and you should read it as a child, then in your early teens, at least another time during your highschool years, as an adult, and finally as an old man. This is believed to be a wise thing to do, and from my experience I can say that you will never be disappointed as a reader. The Little Prince is such a rich read, there’re always things to discover in its lines, whether you are looking for them or not. You just have to be an open-minded recipient. My favourite part is the dialogue between the Little Prince and the fox. My version is in Spanish, so I won’t quote, but I recommend you read it very slowly. Thank you for your words, Emily. A fit review for a work of art. A work of art indeed! I love the tradition that you share of reading it during every phase of life. What a great idea! This was one of my favorite books as a child and one that I often give as a gift. The drawings are just so lovely too. Wonderful post! It is a great gift idea. I like that you bring up the drawings, which definitely deserve some notice. One of my very favorite books from childhood. I recently reread it too. Thanks for the beautiful post! I would like to reblog it on The Armchair Literati in the next few days. Thanks. I’ll need to review it again! I love The Little Prince! It’s one of my favorites. I read Red Glass by Laura Resau last year, and really enjoyed it, in part because there are quotes from The Little Prince and references to the story throughout the novel. Red Glass sounds interesting. Thanks for telling me about it! This is the first real book I read in French and it’s been a huge influence in shaping how I see the world. Nice to see it reviewed here. I’m impressed that you read it in French! It’s an excellent title to start with because the vocabulary and storyline are beautifully simple. As long as you’ve learned the literary past tense, it’s doable. Hi Emily, i read this book when I was a child, but I really think that I should read it every year. In Portuguese, here in Brasil we call “O Pequeno Príncipe”. Congrats for you blog! Yes, a yearly read is a wonderful idea! Thank you for visiting my blog. I read this book last year and absolutely loved it. While it is essentially a children’s book, what is so wonderful about it is that is basically cuts through the crap that we live through as adults and gets to the point. I have the eventual goal to read this in the original French, but considering I haven’t done any French study since I left high school it may be a while until I achieve it! That is a neat goal! I hope you stick to it. Why not? And you’re right about cutting through the “crap” and just keeping things real and simple. It is lovely to read what someone else sees as important in this wonderfully simple, yet profound book. It reminds me of what someone once said to me many years ago after we met a sadhu in Rishikesh, India. They asked me what did I hear. I initially thought it was an odd question as we had both met the guru (though as often I found with male mendicants in India they largely spoke looking at me rather than my female companion). Then I realized that amongst the many different topics and wise words he spoke during the couple of hours we spent with him, there were a few gems that stuck firmly in my mind. These were directly relevant to me and where I was in my life journey there and then. These were what I had heard and they were what I needed to hear – all I needed to do was to realise their importance. Similarly it is with the array of wisdom that is in this little book and what each of us “hear” when reading it. What a great insight! It is very true, but I think it can go both ways. We can also just hear what we want to hear and ignore what we really need. I am glad you shared your experience. It sounds like you had an epiphany and it made a great impact on you. I am privileged that you would share it with me. Reblogged this on HigsBoson's Blog. I love this review. Reminds me to locate this book and read it. I’ve been hunting for it at the public library. It’s always out. Oy vey. Thank you for sharing the quotations. Thank you! I can see why it is always out. People love it! Good luck finding it. Maybe a used bookstore? Reblogged this on Pequenos Gestos. I’ve got a question about the drawings: What did you see in the drawing in the beginning that adulds can’t understand? Unfortunately, I stared at the solution too quickly… So I can’t tell what my first ideawas. My favourite part is the litte prince talking to the fox about love and being loving. Just so true! Oh no! I can’t remember. I appreciate what you said about your favorite part: that it is so true. I think the many truths in this book are what make it so great.